Daily Illuminator: Stuck For A Costume? October 30, 2008: Stuck For A Costume? 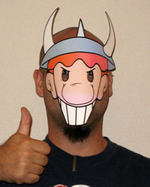 Why not go as the iconic Super Munchkin this Halloween? All you need is the Munckin Mask. . . well, some oversized shoes and weapons might help complete the picture as well. But those won't give you any bonuses. The Mask will.